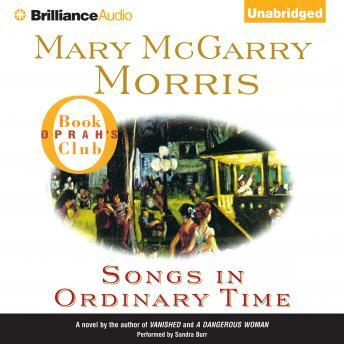 Songs in Ordinary Time is set in the summer of 1960 - the last of quiet times and America's innocence. It centers on Marie Fermoyle, a strong but vulnerable woman whose loneliness and ambition for her children make her easy prey for the dangerous con man Omar Duvall. Marie's children are Alice, seventeen - involved with a troubled young priest; Norm, sixteen - hotheaded and idealistic; and Benjy, twelve - isolated and misunderstood, and so desperate for his mother's happiness that he hides the deadly truth only he knows about Duvall. Among a fascinating cast of characters we meet the children's alcoholic father, Sam Fermoyle, now living with his senile mother and embittered sister; Sam's meek brother-in-law, who makes anonymous "love" calls from the bathroom of his ailing appliance store; and the Klubock family, who - in complete contrast to the Fermoyles - live an orderly life in the perfect house next door. An Oprah Winfrey Book Club pick. Well ... might be me but it seemed like the same old same old , sooo many troubles Typical Oprah recommendation . Too many minor characters that were thrust in in the middle of a storyline, not fully developed and then not resolved. Spent too much time on characters not central to the plot and did not fully resolve the stories for the main characters of the book.